Witamy! As you might imagine, receiving support from the Polish Embassy would be huge for our book. We’ve just been invited to sign our books at the Embassy of the Republic of Poland at an annual open house event for the Embassies of the European Union. About 5000 people are expected to pass by our table, having just sampled kielbasa & pierogi. WOW! 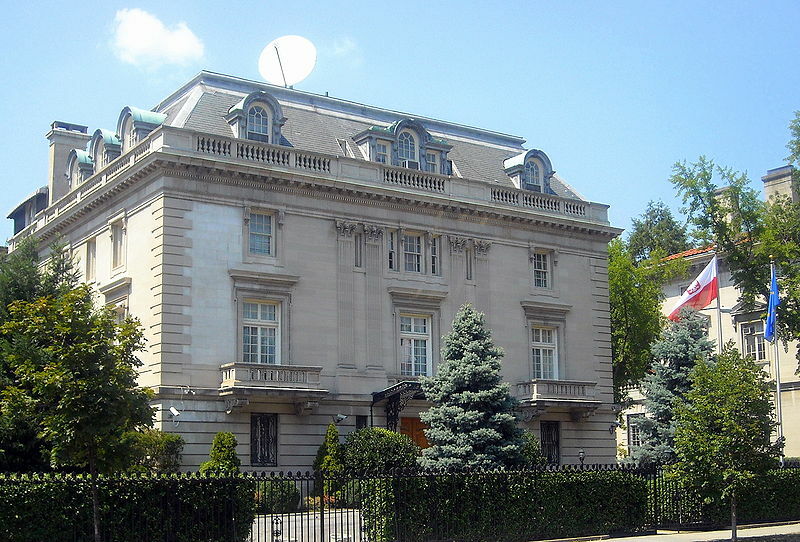 We had a connection with a senior embassy official – one of those “friend of a friend” scenarios that are pretty typical in Washington DC circles. On the phone, my new acquaintance at the Embassy was very willing to support our book, but advised that the Ambassador first needed to see and approve it – perfectly understandable. But the book was on press in China somewhere and wasn’t to be shipped for quite a while. So Rebecca, our Sales Manager at Pelican Publishing, came to our rescue by sending us the “F & G’s” – which stands for “fold and gather.” In other words, the book’s pages were taken off the press, folded and gathered in their correct order, but not bound into their hard cover. We were invited to coffee at the Embassy to chat about the book and hand off the pages, but Laura chose not to go because she does not speak Polish. I would be meeting with my contact plus the Cultural Attaché who usually takes care of these types of events. 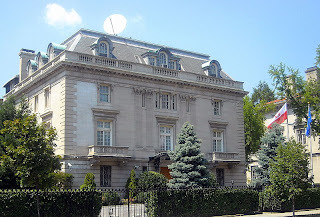 I had been in the Embassy before – the public spaces are like a small European palace with beautiful drawing rooms, fine Polish works of art of Poland’s most famous historical figures, beautiful renaissance furniture, and so on. I was escorted into one of these drawing rooms by my host. In a corner of the room sat a low coffee table, set with crisp white linen, fine delicate china, a small silver urn of coffee and a plate of small sweet cookies. It was an elegant and impressive setting. After exchanging pleasantries, we got down to the issue at hand. They were quite interested in having us display and sign books at this Open House on May 7, 2011. Our book is a great fit since the Ambassador is particularly interested in sharing Poland’s culture and traditions with Americans. This event is an annual celebration of international culture presented by Cultural Tourism DC and showcases Washington DC’s embassies and cultural organizations with a wide range of performances, talks, and exhibits. Over 5000 people passed through the Polish Embassy last year. Food tables will be set up in one of the rooms on the tour for sampling typical Polish food such as kielbasa and pierogi. Our table would be right after the food – I couldn’t ask for a better spot – location...location...location! A few days after the meeting, we received word that and everything was all set for us. Plus, the Embassy officials agreed to distribute a flyer about our book at this event and at subsequent gatherings. That’s very cool! So now we have to make up several thousand flyers and take a guess at how many books to bring - a dart board or crystal ball would be helpful. Here’s a link for more information: http://www.eurunion.org/EUinUS/ If you live in this area, come by on Saturday May 7, 2011 from 10AM to 3PM - we’d love to see you and sign your book!